Our Ford dyno service is equipped with a 1600 horsepower capable Land & Sea engine dynamometer. The computer controls and data acquisition allow us to accurately R&D new parts and engine combinations. Before shipping to you, we can break-in, test, and tune your engine in either fuel injected or carbureted form with or without power adders (i.e. supercharged, nitrous oxide, turbocharged). Ford engines with EEC-IV can be tuned the customers electronics and one of our software packages for a “turn-key” installation. Since 1999 Panhandle Performance has tuned hundreds of vehicles on our Mustang dynamometer. Our goals when tuning are to supply our customer’s vehicles with the best drivability, performance, and reliability available. With a wide choice of tuning packages such as Diablo CMR, EFI Solutions, Deltaforce (formerly Sniper), Autologic Chipmaster, and others, we have the tools needed to make your Ford vehicle perform the way it should. Of course, no software will replace a well-seasoned tuner. Our dyno tuning includes the services of an expert with extensive experience in the tuning requirements and design of Ford’s engines. From pump gas street cars to record setting race winners we can get the job done! We sell and tune aftermarket standalone systems as well. We currently offer systems from Accel, Big Stuff, and Fast. Other systems are evaluated on a regular basis so call for an update if you have an existing system not listed that you would like for us to tune. 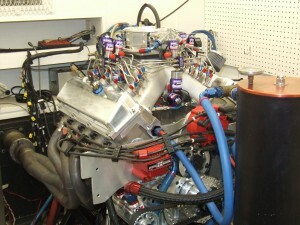 Due to the nature of our business we offer our dyno services for tuning only. We do not sell “pulls” or rent time to other tuners.